With the 2-Person Sevylor Inflatable Kayak you can enjoy the feel of a full-size kayak with the convenience of an inflatable boat. This two-person kayak comes equipped with a fixed seat in the rear and a removable seat in the middle. 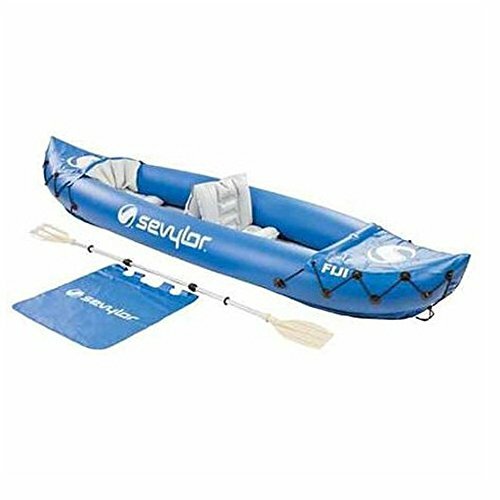 The 22-gauge PVC construction lets the Sevylor Inflatable Kayak stand up to multiple seasons on the water and is backed up with our AirtightÂ® System, which is guaranteed not to leak. Just in case you do hit a snag, the multiple air chambers will help you get back to shore. This kayak is also NMMA certified to hold up to 400 pounds. *Includes paddle and carry bag *Inflated dimensions: 10 ft. 4 in. x 2 ft. 9 in.